F-Fect - Music Is My Life. F-Fect - Let the Love in on the Floor. Hi, I&apos;m Floris and I&apos;m a Dutch DJ.My favorite genres are Hardstyle and House, although I enjoy pretty much every kind of music. 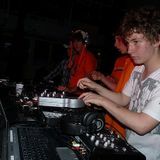 If you want to know more about me, you can send me an e-mail or follow me on Twitter (@DJFFect, only for the Dutch viewers, sorry (: ). Enjoy my mixes!